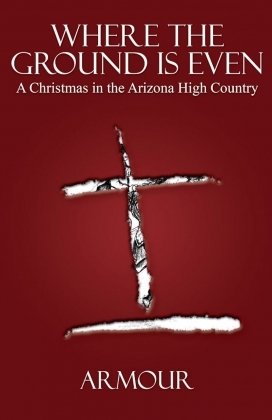 In Where The Ground Is Even, readers join a band of uniquely diverse sojourners, each with his own agenda, who converge on the small town of Flagstaff, Arizona, in the days before Christmas of 1881. Three Navajos ride from the east toward a white man's world of which they are suspicious. Two carefree but pining sheepherders walk through heavy snow from the west. A young family, the man wounded and the woman full with child, move north desperately ahead of a rage-filled cattleman and his men. A young, rakish deputy sheriff rides up from the southwest in pursuit of a wanted man. All converge at the foot of the San Francisco Mountains where their lives become forever intertwined. 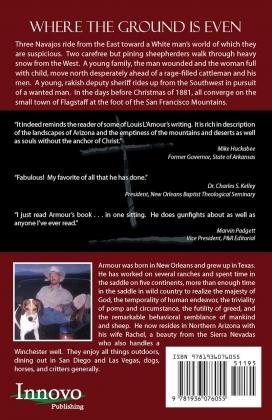 Armour was born in New Orleans and grew up in Texas. He has worked on several ranches and spent time in the saddle on five continents, more than enough time in the saddle in wild country to realize the majesty of God, the temporality of human endeavor, the triviality of pomp and circumstance, the futility of greed, and the remarkable behavioral semblance of mankind and sheep. He now resides in Northern Arizona with his wife Rachel, a beauty from the Sierra Nevadas who also handles a Winchester well. 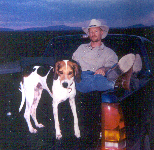 They enjoy all things outdoors,dining out in San Diego and Las Vegas, dogs, horses, and critters generally. "I just read Armour's book… in one sitting. It's a great, heart-warming tale. He does gunfights about as well as anyone I've ever read--and that's quite a few gunfights and battles." "The story is truly excellent. The narrative is wonderfully descriptive; the characters all have their own uniqueness and blend together very well indeed. The whole flavor of the west comes out in every page, and Teo is a wonderful hero for the story. All in all a thoroughly good read." "Presenting the gospel story through a 'mass' said by a Catholic, Franco-Mexican lawman was one of the best touches I have ever seen anywhere." "It indeed reminds the reader of some of Louis L'Amour's writing. It is rich in description of the landscapes of Arizona and the emptiness of the mountains and desserts as well as souls without the anchor of Christ." ".... Fabulous! My favorite of all that he has done. 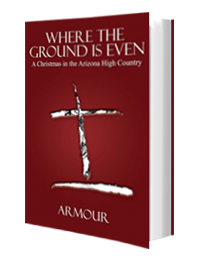 It is the Christmas story Louis L'Amour would have written if he had been a believer. Bless you!" "Full disclosure: I know the author 'Armour,' aka Armour Patterson. We joined a group on a trip to Israel years ago, where it was instantly apparent that he falls into the "great guy" category.... I count half a dozen or more compelling secondary characters and one absolutely great protagonist. And that Bowie knife? We know its going to come into play in the end, and when it does--never has a mute blade been more eloquent in its actions." "I began reading Where the Ground is Even on a Saturday morning and didn't put the book down 'til I had read the entire story. Women will fall in love with Teo, the protagonist in the story. He possesses a quiet strength and exercises perfect discretion in when, where, and how to use it-sometimes as a fearless protector; other times, to temper justice with mercy and grace. If there was a "Proverbs 31 man", Teo would be the one." "Each storyline brings forward a unique human perspective along with well researched historical context. From Navajo heritage to the professional wielding of a Bowie knife to the description of the Sonoran desert and high country fauna, Patterson subtly weaves a supporting fabric that both the novice and seasoned aficionado will enjoy."